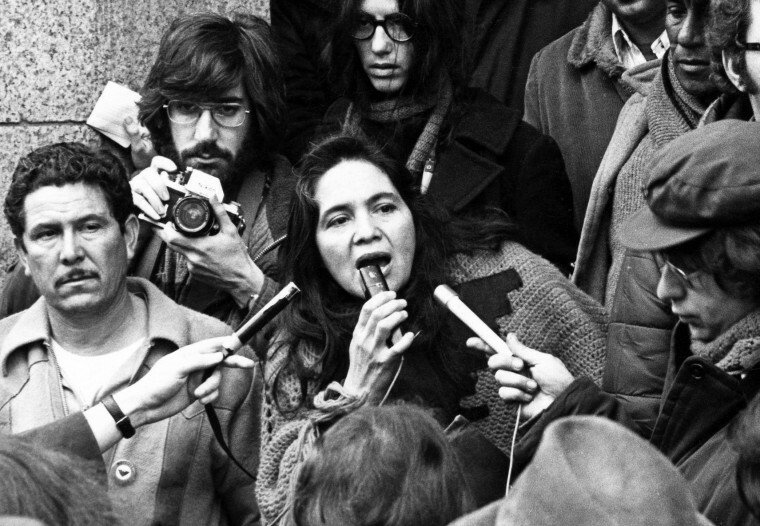 WASHINGTON, D.C. — She’s been called by some “the most vocal activist you don’t know,” and a new documentary about civil rights icon Dolores Huerta aims to change that perception and correct history that has long left her work and accomplishments out of the picture. "Dolores," which was first shown earlier this year at the Sundance Film Festival and premieres nationwide in September, celebrates Huerta’s more than six decades as a community activist and force within the labor movement as co-founder of the United Farm Workers of America, or UFW. Huerta worked side-by-side with the more well-known César Chávez and rose within the union to unprecedented levels for a woman back in the day. She negotiated the UFW's first contract with the grape growers and helped write legislation, and she coined the famous Sí Se Puede (Yes We Can) slogan, later famously adopted by then candidate Barack Obama. In 2012, Obama awarded Huerta with the Presidential Medal of Freedom. “But this is not just about my story. It’s stories about the poorest people in our country, the farm workers being able to overcome a lot, and that story needed to be told. They need to be told to Anglo children so that they know the history of the immigrants and indigenous people that built this country, and the children of color need to hear those stories so that they can be proud of what their ancestors did here in the United States of America. And the message is pertinent today,” Huerta said at the film's Thursday night premiere at the Smithsonian Museum of the American Indian in Washington. Co-produced by music legend Carlos Santana and directed by independent filmmaker Peter Bratt, whose brother is actor Benjamin Bratt, "Dolores" makes extensive use of archival footage and interviews with key players in the civil rights and labor movements. It delves into the all-too-familiar world for many women, that of the unsung heroine toiling behind the scenes while the limelight shines on the men who are supposedly running things. Huerta, nonetheless, prefers to give recognition and praise to those she says are even more unknown than she is. Dolores was born Dolores Clara Fernández on April 10, 1930 in the mining town of Dawson, New Mexico, the daughter of a miner and union activist who later became a New Mexico state assemblyman. Her parents divorced when she was 3 and was raised in the central California farmworker community of Stockton, where her mother owned a restaurant and a hotel where farm workers were welcomed. Huerta attended college at Stockton College (later to become San Joaquin Delta Community College), where she earned a teaching credential. She began her community organizing work after briefly teaching elementary school. Huerta does call her involvement in the early days of the feminist movement one of the most important periods of her life, and credits it with helping to reshape her view on key issues, including Latina female empowerment and choice. “When I went to Delano (California) to work with the farm workers, I had to tamp down my feelings about women in power because there was a different ambiance with the male dominance in the movement. There were a lot of women in the movement, but we saw we needed to be on the executive board,” she said during a Q&A after the screening of the film. Huerta said she went through a transition when it came to female empowerment. “The feminists helped me understand why it was important for women to be able to have control of their bodies and control of their lives. As women, we need to step up,” she told the crowd. The film suggests that “machismo” was one of the reasons Huerta didn’t take over the helm of the union after Chávez died in 1993, and that it was a factor in her decision to leave the union and start the Dolores Huerta Foundation. The organization focuses on a more diverse platform of community organizing and social justice issues. She also is active in politics and national issues and has campaigned for Democratic candidates ranging from Robert Kennedy to most recently Hillary Clinton. Huerta said that as “an addicted organizer” she had already taken a leave of absence before Chavez's death to work on feminist movement issues, and that taking the UFW presidency would have meant having to give up that work. The film also takes a look at how Huerta’s activism and frequent absences affected her home life, including her 11 children. All adults now, several commented that while it was hard growing up, they understand why it had to be done. Chávez added her mother is too busy working to think about why she doesn’t have a state holiday or U.S. postage stamp commemorating her. "There are so many people out there. They should be on postage stamps as well. Why does there have to be a limit? Many more people should be celebrated and more stories should be told because there are people out there every day doing the work,” said the civil rights icon's daughter. The film also shows a lighter side of Huerta; the film shows her love of dancing and jazz music. Huerta said that despite meeting and interacting with many famous and iconic figures throughout the years, it was being introduced to jazz musician Charlie “Bird” Parker that left her uncharacteristically speechless. "Dolores" premieres in New York on September 1st, with showings throughout the month of September in cities all across the country.